My camping, hiking and backpacking experience has included trips varying in length from one-day hikes to two-week trips. My experience hiking began with my father when I was about six years old. We hiked along the river pathways in northeastern Ohio and western Pennsylvania. While enjoying the outdoors with my friends and family, I spend time hiking, geocaching, snowshoeing, cross-country skiing and camping. Although I am not a lightweight backpacker, I am trying to ‘lighten up’. I spend almost as much time outdoors during the winter as I do during the summer. Upon receiving the ToughSkin, I was surprised at how light it felt. The outside of the pad looks similar to other pads I've used. According to the advertising materials on the website, it's what's inside that sets it apart. The inside is made up of two layers; the top being open-cell foam, the bottom is closed-cell foam with a air holding seal in between. The purpose of this is to decrease the chances of the pad being ruined by a puncture. The closed-cell foam is less likely to sustain a puncture, and if it is punctured, the seal is designed to keep it from effecting the open-cell foam. The open-cell foam is increases the pad's R-value. R-value, simply put, is the insulating value of an item. The 'R' actually stands for thermal resistance. It is most commonly used as a comparison reference point. The closed-cell foam also acts as another insulating layer. The mattress appears as I expected from the website. I am new to this type of sleeping mattress, so I am very interested in the closed/open-cell concept layering. I will be looking at how comfortable the mattress is. Because it is winter here in Maine, looking at warmth is a big concern also. Although I'd hate to see the mattress get punctured, if it does, I will note how it performs after that. It is advertised "Even punctured, mattress continues to provide essential warmth, comfort, and performance". After opening and letting the mattress sit until the next day, I took the opportunity to lay on the mattress on my wood floor, and found that it was very comfortable. It did disappear for a day or so - my daughter decided to try it on her bed. I hadn't noticed it missing, but found it when I sat on her bed. She loves it, but knows she can't have it. I am also glad to report there was no 'plastic' smell to it. I must be overly sensitive to things like that. The mattress apprears to be well made, with a tapered, rectangle shape. Living in Northern New England, I have the good fortune of being able to experience at least 4 seasons (sometimes within days of each other!) and some of the best outdoor areas around. During the next four months our temperature range will run from the current of 42 degrees F (5.5 C) down to about 0 degrees F (-18 C). During the months of January through the beginning of April I spend a good deal of time snowshoeing and ice fishing. I am looking forward to testing the Therm-a-Rest ToughSkin mattress. This ends my Initial Report, I will amend it in two months to report on my field information. Over the last two months I have had numerous opportunities to use the ToughSkin. It is amazing how such a thin, lightweight item can make such a different in a night's sleep and improve the mood of the user. I love backpacking and being outdoors - I also NEED a good night's sleep. The sleeping pad has helped make me a 'happy camper' lately. Using the ToughSkin is simple - unroll it, open the valve and give it a few breaths, close the valve and lay down. I have used it on top of a cot in a cabin for a long weekend. It not only made the cot more comfortable, I believe it helped keep me warmer after the fire went out. While using the sleeping pad in a tent, it smoothed out some very rough ground! Both nights the temperatures were in the low 20s F (-6 C) and I was using a -20 F (-29 C) sleeping bag. Between the bag and the pad, I was very comfortable temperature-wise. I didn't use the pad locks on the sleeping bag with the pad and haven't felt the need. Some pads seem slippery, but the material used on this one, while not rough at all, is not slippery. I also think that because I am sleeping well while using the pad, I don't toss and turn much, which helps keep me on the pad. I can't speak to the scientific make-up of the open - cell/closed - cell pad, I find it comfortable and I am able to sleep well without having pain in my hips or shoulders from different pressure points. The open/closed feature is what Therm-a-Rest advertises as increasing the thermal resistance. Open cell insulation traps air and closed cell keeps the cold air from moving through the pad to the person sleeping on it. There is also another 'sealing' layer in between. Another feature of the pad is that its tough outer skin keeps the pad from losing its insulating value even if punctured. Thankfully, the pad has not suffered any damage, but from the feel of the material, it appears 'tough'. The pad is well constructed, with no signs of wear. I have used a wet cloth to wipe it down after each trip and it remains looking new. I am looking forward to taking it out again soon. This concludes my field report. The long term report will be completed by May 15, 2007. Please check back for further information. 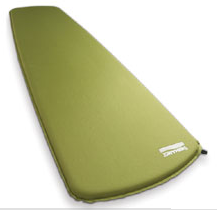 The Therm-a-Rest ToughSkin Sleeping pad has lived up to its name 'ToughSkin'! Over the last two months of use, I have taken it backpacking and camping, using it in a cabin and in my tent on nine occasions. I had originally planned to spend two weekends sleeping out in a wooded area in western Maine, on some land owned by some friends. The friends planned on sleeping in a cabin with some of the kids. The friends backed out, so I needed to sleep inside the cabin with the kids. Five of those nights were spent in a cabin with minimal heat - a small wood stove fire that didn't last through the night. We had similar weather conditions on both occasions. Outdoor temperatures ranged from - 5 to 20 degrees F. (-20 to -6 C). Indoor temperatures went down to 32 F (0 C) according to my outdoor computer. We spent the days backpacking and eating - the boys were working on a cooking merit badge for Boy Scouts, and we 'needed' to eat a lot to keep warm! The first weekend (3 nights) was cold, windy and snowy without significant accumulation. The next weekend out (2 nights) in the cabin was a little warmer to start with - the boys remembered to start the fire early, so the room would heat up. By early morning, the fire had gone out and the room was cold enough that ice formed on the inside of the windows, which I didn't notice the first time out. The outdoor computer didn't record the temperatures on this occasion unfortunately, but going by 'feelings', I believe it was well below freezing by morning. During both these weekends the sleeping pad helped to provide a warm foundation for my sleeping bag. Once inflated, the pad provided enough cushion that I didn't wake up from pains in my hips (I sleep on my side most of the time). I was surprised that the pad compressed so little from my body weight. After the second weekend I arrived home to find out that the contents of my trunk shifted, causing the bottom of a pair of snowshoes to be pressed into the rolled up sleeping pad. I was sure that there would be a hole in the pad. Luckily, there was no hole, but there was an indentation of about .25 inch (6 mm). After we unpacked, I tried pushing from the other side of the pad, hoping to remove the indentation. That didn't work, but my husband suggested inflating the pad. That helped a little, but the indentation was still visible. Inflating did show that there was no puncture though. Recently, I have been able to sleep on the pad inside my double walled tent while backpacking with some friends in northern New Hampshire. Both nights the temperatures stayed right at the freezing point. I used the pad in combination with my -20 F (-29 C) Sierra Designs Electra sleeping bag and found that the combination of the pad and the bag worked very well together. The pad helped provide insulation from the still frozen ground and the bag helped keep my body temperature at a comfortable level. The extra cushioning of the pad really also helped make for a more comfortable night's sleep. The first night, I felt cold when I went to crawl into my bag. Once I warmed up, I slept well until about 4 am when the wind picked up and made the tent vibrate and caused some strange noises. The second night with temperatures hovering at the freezing point, I wasn't chilled when I got in the bag, probably in part due to having just eaten a large meal. I fell asleep quickly. I did awake about 2 a.m. and felt a little chilly. In part due to not having my sleeping bag zipped all the way up. I eventually was able to go back to sleep and found that I slept very late into the morning. I woke with no joint pain, as sometimes happens when I sleep on the ground. The sleeping pad worked extremely well, keeping me from awaking with sore spots on certain parts of my body that pressed against the pad. Early in May, I used the pad in much colder conditions while backpacking in Northern Maine. The area is heavily wooded and the elevation is only about 1200 ft. (366 M) Daytime temperatures were in the mid 30's F (-1 C) and night temperatures were in the low 20's F (-6 C) at night. The winds were fairly strong and cold at times. The first night I was a little chilly when I got into my sleeping bag (inside my tent) I found that I warmed up fairly quickly and slept well - again feeling no pressure points or sore spots in the morning. On the second night, I took a cup of hot chocolate into the tent with me. I went to sleep while I was nice and warm. Unfortunately during the night, I spilled the little bit of chocolate that was left and it dripped on my bag and sleeping pad. When I woke up, I was able to easily clean it off the pad with just a damp cloth. I am extremely happy with how well made and durable this pad is. I don't find that I have to 'baby' it at all. There is no obvious sign of wear at this point. I did end up using the pad locks during this test phase, mostly because if I roll off the pad, I definitely notice the difference in temperature. The floor of the tent is extremely cold and uncomfortable. The pad locks work very well, and it is easy to situate the pad within the padlocks. As long as I remained on the pad I didn't feel the cold of the ground. I also happy to report that there is barely a dimple left on the pad from the snowshoe incident. I appreciate the opportunity to test this pad - it is definitely a keeper! My thanks to backpackgeartest.org and Therm-a-Rest.